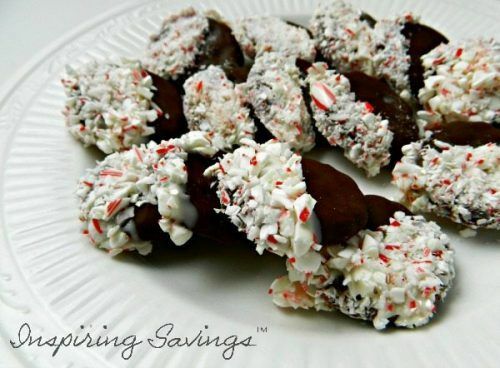 We could not believe how delicious AND simple these No Bake Peppermint Dipped Cookies are. Made with 3 ingredients. Perfect for your next Christmas Cookie Exchange. We’ll be honest: These Easy No Bake Peppermint Dipped Cookies, are incredibly simple to make. Most of us during the holiday are strapped for time. That’s all the more reason to give them a spin this season. I am not going to lie if you can melt chocolate, you are already at an expert level when it comes to this recipe. Seriously, this is as hard as it gets. But hold on, before we get started, let me tell you what you’re going to need — there are only 3 things, but you’ve got to get these particular 3 things: a box of Keebler Grasshopper Mint Fudge Cookies of Wiltons White Chocolate Candy Dips, and Candy Canes. That is right, three store-bought items. Easy peasy. These Easy No Bake Peppermint Dipped Cookies would be perfect for your holiday cookie exchange, after a big holiday meal or leave a plate for Santa and his elves. Place your peppermints or candy canes (you will need about 12 candy canes for a whole package of cookies) in a large plastic storage bag. Roll them with a rolling pin until they’re crushed. Place them in a bowl for later. In a medium-sized bowl, melt the candy melts in the microwave for 30 seconds at a time, stirring after each cook session, until smooth. Once the candy melts are smooth, dip the grasshopper cookies about halfway into the melts (be fast, so the chocolate from the cookies doesn’t mix into the white candy melts). Immediately dip them into the bowl of crushed peppermint, covering the candy melts, and set them on wax paper to cool. Don’t they look beautiful? Almost as if you slaved over a hot stove all day. SHHHH, I won’t say a word. Your secret is safe with me. In a medium-sized bowl, melt the candy melts in the microwave for 30 seconds at a time, stirring after each cook session, until smooth. Once the candy melts are smooth, dip the grasshopper cookies about halfway into the melts (be fast, so the chocolate from the cookies doesn’t mix into the white candy melts). 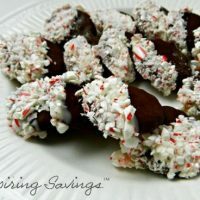 Immediately dip them into the bowl of crushed peppermint, covering the candy melts, and set them on wax paper to cool.